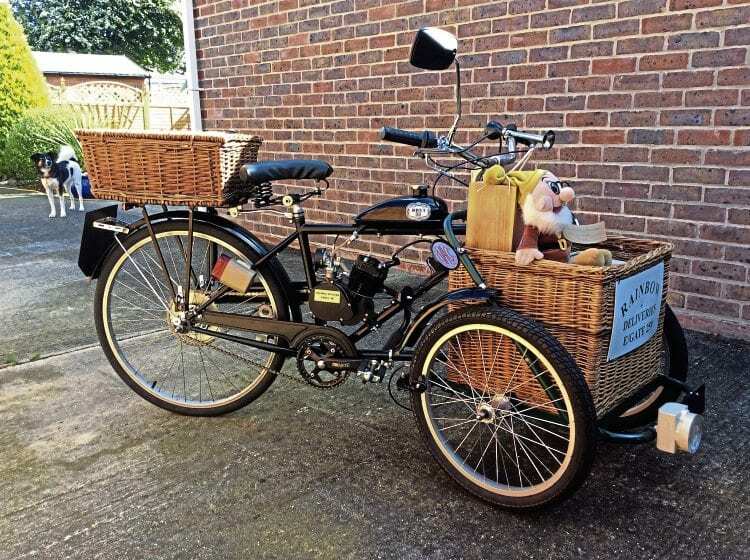 ‘Flying Vicar’ strikes again – with a trike! Some time ago, I decided to build a sidecar and trailer to attach to my D14/4 BSA Bantam with successful results, but then I started thinking about my next project – or two. I’d always had a hankering to build a trike, and saw myself on an autocycle, so I found an old bike frame, cut a few bits off, made a long downtube, a centre rod for steering and a lower support tube for strength. Then I started to make a square-shaped front frame for fitting a large basket to carry goods in, and fitted two wheels to this, and one at the back. A pigeon-fancier’s dream? This is the amazing trike, complete with high-mounted 49cc Russian engine, that Richard Bennett (otherwise known as the ‘Flying Vicar’) has built. We wondered what he’d been up to all this time! See more images relating to this letter in the July issue of OBM. Now I needed a power unit, but which one? I managed to acquire a Russian engine – a 45cc Krasnoi Octjabr Kroxa, which was duly fitted and running soon afterwards. Next, I set about fitting ancillary parts such as lights, mudguards and basket, and I used a motorcycle handlebar complete with brake lever and twistgrip. The road test was great, so then it was on to the DVLA – yes, well, still ongoing, but I will succeed and run it on roads in Sussex. To get it to shows I built a trailer with alloy channel for the runners, stainless steel ramps, number plate and light and wheels from one of those baby buggies that you see being towed behind bicycles. So what tows the trike on its trailer? The BSA Bantam outfit, of course! Read more Letters, Opinion, News and Views in the July 2018 issue of OBM – on sale now!